...that the sterile field generator is a piece of human medical technology that eliminates harmful bacteria and other microorganisms in its area of effect? ...that you can convert an enemy Elite to your side in Halo 5: Guardians? There is more information available on this subject at Oxygen on the English Wikipedia. 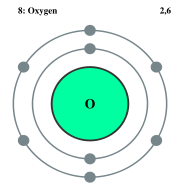 Diagram of the oxygen atom. Oxygen is the element with atomic number 8 and represented by the symbol O. It is a member of the halogen group on the periodic table, and is a highly reactive nonmetallic period 2 element that readily forms compounds (notably oxides) with almost all other elements. At standard temperature and pressure two atoms of the element bind to form dioxygen, a colorless, odorless, tasteless diatomic gas with the formula O₂. Oxygen is the third most abundant element in the universe by mass after hydrogen and helium and the most abundant element by mass in the Earth's crust. Oxygen constitutes 88.8% of the mass of water and 20.9% of the volume of air. Oxygen can form a covalent bond with two hydrogen atoms to create the compound water, an essential to many life forms. The Lewis pair structure for this is H:O:H where each colon represents two valence electrons (electrons shared). Oxygen in the form of O₂ is produced from water by cyanobacteria, algae and plants during photosynthesis and is used in cellular respiration for all complex life on Earth and many other worlds. The majority of the known sapient species respire using oxygen, having evolved on worlds with oxygenated atmospheres, including humans, the majority of the species that made up the Covenant, as well as the Forerunners. The only known species who do not breathe oxygen are the Unggoy, who breathe methane instead. The Covenant symbol for oxygen is twin dots, surrounded by a triangle.